Yeah, but: I have no idea how to rate this. The Long Version: William Gibson writes something broadly called "speculative fiction," and his trademark is combining media, technology, and popular culture into a near-future mashup. His novels seem outlandish for the first fifteen or twenty years, but after that it's harder to remember what the big deal was. 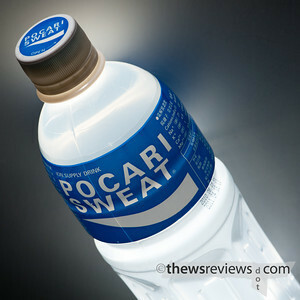 His fascination with cultural oddities in general, and Japanese culture in particular, shows through with some inventive product names like 'Come Back Salmon' and 'Pocari Sweat'. Sometimes life can be like that. 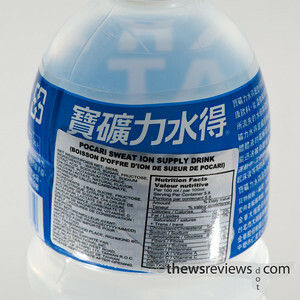 The decidedly non-fictional Pocari Sweat is an 'ion supply drink' that's been sold in Canada for at least eight years, which is when I first saw it in a local grocery store. It's also relatively easy to find for sale online, where the option to get a powder cuts down on the shipping cost. As a sports drink it's essentially salty sugar water, and tastes like thin sweet lemonade but with a lingering grapefruit aftertaste. I'm not a fan of grapefruit, but the combination of sweet with tart works fairly well, and when it's chilled the flavour is subtle enough that it's easy to drink. The various product websites are full of gems. The global site is an elaborate justification of the scientificy benefits of the drink, with statements like "It is well known that sweat is salty. This proves that sweat is not just water. 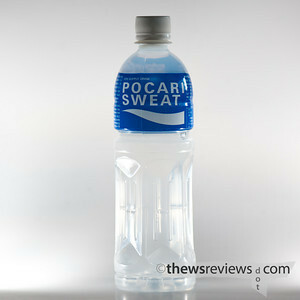 Since sweat is made from body fluid, many electrolytes are lost during perspiration." The english-language site for the Philippines recommends the product after long hot showers, to ward off hangovers, and when enduring bouts of diarrhea. Seriously, I know that dehydration can kill, but how many times do you see the word diarrhea in a food ad? I imagine a pocari looking like a cute cross between a hamster and a ferret, but with really big eyes; the manufacturer, Otsuka Pharmaceutical Co., hasn't actually released any photos of these creatures and doesn't comment on their care beyond their corporate statement that pocari don't really exist. But we heard that same story before the Oompa-Loompa doping scandal broke, so I can only trust that no actual pocari are harmed in the production of the beverage. But realistically, I'll just stick with Coke. Love how you lit the first photo. In fact, I love it so much I think I'm going to steal the technique. I do like that lead photo, but there are a lot of things that I'd rather do than photograph clear plastic bottles. I found my answer to all those hangovers! And possibly, diarrhea! Bill: Thanks, and I'm looking forward to seeing what you do with the technique. Prologue: Just like those poor Oompa-Loompas.